Baja California. It fired my imagination like a heat-haze hovering between hallucination and reality on the distant desert horizon. When my buddy JD Smith called inviting me to join him for a two-week adventure to Cabo, I hopped excitedly like a Mexican kangaroo rat in estrus. I envisioned Baja’s savage beauty unfurling as if in an IMAX movie as we cruised down Highway 1, with occasional feral forays away from the hardtop. September 26, 2016, started out well as we roared south down I-10 from Palm Springs for Calexico and the Mexican border. I’d never crossed the frontier and was amazed that no official stopped us or asked for our papers. Just a five mph ride through the metal-studded border chicane and we emerged into rough-edged Mexicali. We cruised west along Federal Highway 20 and rocketed up the long, sweeping grade—sinuous as a culebra—that spiraled from sea level to deposit us at 1,200 meter elevation atop the ridgeline of the Sierra de Juárez. I savored the wonderfully temperate weather as we lunched in La Rumarosa, far above the oven-hot desert floor. We were now up amid juniper and Jeffry pine at the northern gateway to Parque Nacional Constitucion de 1857. The remote park—a place of stark, lonely grandeur—is accessed by an unpaved road and rough trails. We adjusted our ESA pre-loads and hit the track on the pegs. 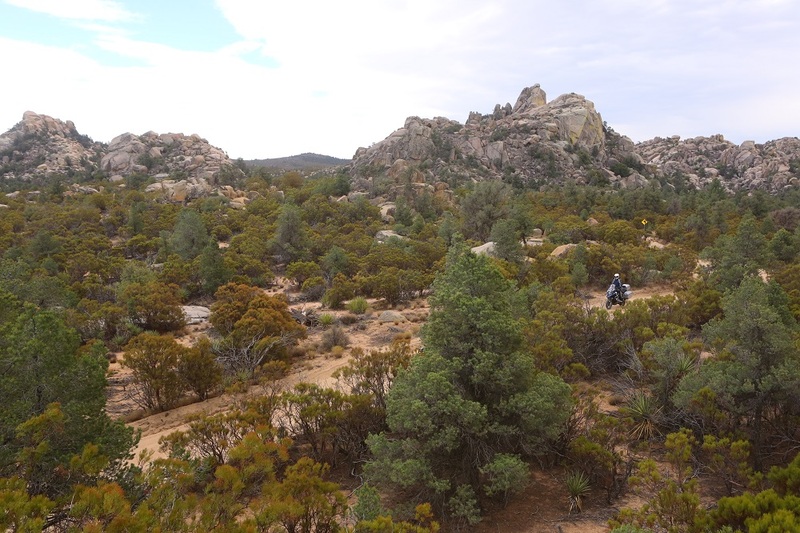 The sandy trail rolled and pitched through a grandly chaotic landscape studded with fantastical granite boulders. The boulder gardens were interspersed between alpine meadows cut through by sand-filled washes and deep rock-strewn arroyos. Soon we were hammering over washboard and through deeper pools of glistening granitic sand. A couple of times I felt the front wheel lose traction and slide. Then the Metzelers dug in and momentum kept the Beemer on course. Then, ninety minutes into the ride, I went down. Hard. Fast. And totally unexpected. I was riding on hard-pack with my forefinger covering the brake when my front wheel wavered in an unanticipated patch of sand. In a millisecond the front wheel dug in and slammed sideways as the rear end jack-knifed and flung the bike on its side. I sensed my left leg being twisted beneath the BMW as it fell. Had it gone under the pannier? Even as the dust settled and my mind came into focus, I lay on my back in the soft sand knowing that my vacation had ended. I levered off my helmet and crab-crawled on my back to shut off the ignition. There was no point in trying to stand. I could feel my lower leg loosely detached inside the Sidi Crossfire boot. I raised my head and noted the oddly articulated position of my foot. I wiggled my toes. That seemed a good omen. And I couldn’t sense any warm, sticky presence of blood. Then I tried raising my knee and through the sudden gnawing ache felt the motion of bone against bone floating free in a gelatinous mass. An ugly thought crystallized: This is bad! Still, I felt strangely sanguine as I lay in passive torpor waiting for JD to acknowledge my absence and return. But where was I going to get medical treatment? Good medical treatment! And how were we going to get me out of here? We’d passed not a soul. We were miles from the nearest cell tower. And riding pillion with JD was unthinkable. Twenty minutes passed. Finally I heard the thrum of JD’s water-cooled GSA. As JD leaned over me, a Nissan pickup emerged around the bend. ¡Que maravilla! Two Mexicans emerged, brows furrowed in abject concern. We contemplated bundling me onto the back-seat. The Mexicans wisely demurred: Better to let professional medical staff secure my leg before moving me. They agreed to ride back along the 40 miles of rough track to La Rumarosa to summon an ambulance. It struck me as amusing that the Cruz Roja ambulance arrived with sirens wailing. 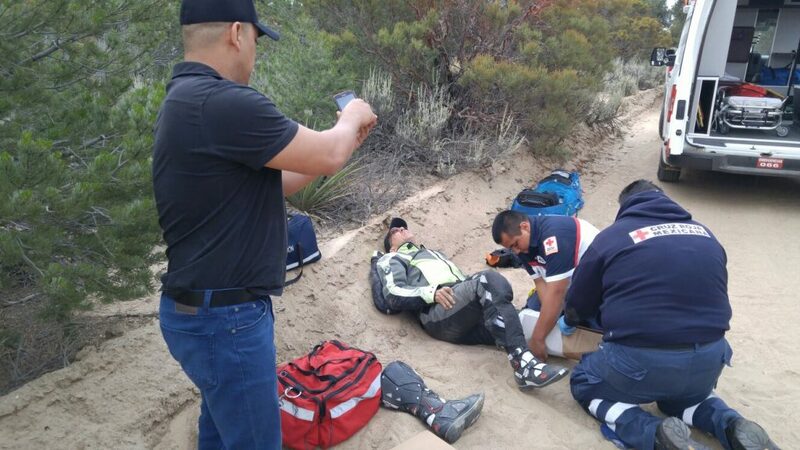 I watched laconically as paramedic Leonel Gasca Hinojosa cut away my BMW GS pants. His compañero, Isaias López Granados, signaled to brace myself. I clawed the ground against the agonizing pain as Leonel gripped tight my mushy limb and Isaias wrestled the Sidi boot until the pulpy leg and foot plopped free. They straightened the foot then wrapped it in cardboard, which they folded into a triangle and bandaged tight as a makeshift brace. I reasoned that being medevaced to the USA was my best option. I’d had the foresight to buy insurance in case I got hurt in the boondocks. But would my insurance cover this medevac? And how long would those arrangements take? My priority was to get my leg stabilized. Thankfully, after a two-hour ride I was wheeled into Hospital Almater, in Mexicali. Good call! By chance, Almater specializes in orthopedics and is popular with U.S. citizens for medical tourism. Within the hour I was being laid out on a radiology scanner. 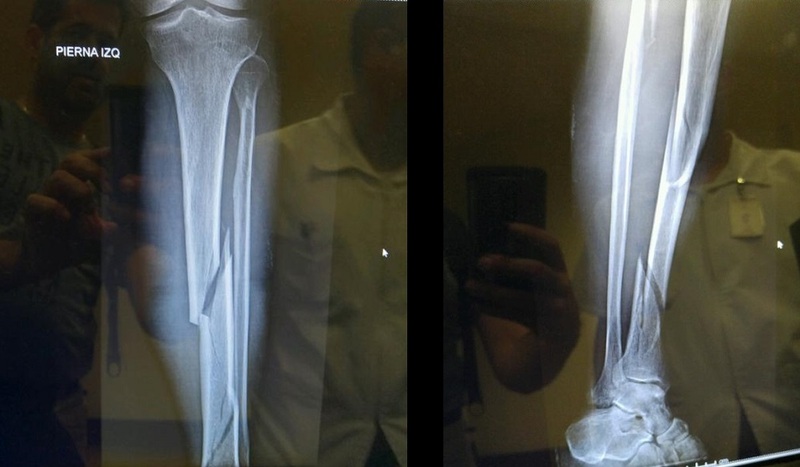 “It’s a terrible fracture,” said orthopedic surgeon Dr. Humberto Carlos Torres. “Almost a rompacabeza,“ he added, likening it to a jigsaw puzzle. My tibia had been torqued into five dagger-shaped pieces, each fissured with seismic faultlines. My fibula had sliced cleanly in two. Looking at the razor-edge breaks, I felt glad I’d been wearing new Sidi Crossfire 2 boots. Their rigid polyurethane protector plates had surely prevented the bones displacing laterally and tearing through arteries and flesh as my foot and lower leg were violently wrenched. “It needs surgery. But don’t worry. We can fix it,” said Dr. Torres, reassuringly. He proposed inserting an intramedullary tibial nail down the shaft of the bones to pin the rompacabeza together. “You’ll be walking again in a few months,” he added jovially. I liked his confidence. Then I was informed that Almater wouldn’t accept my insurance with UK-based International Medical Group. I’d purchased IMG’s Patriot Multi-Trip travel package (good for 365 days travel and medical coverage up to $1 million) specifically because it insured for injuries incurred while motorcycling. For good measure, I’d also purchased their Adventure Sports Rider. I figured I was staring at a major hospital bill. Fortunately, the quotes Almater gave me were insanely cheap by comparison with the USA. My credit cards could pick up the short term. Nonetheless, I was still mulling being medevaced to Eisenhower Desert Orthopedic Center, near my home in Palm Springs. JD had been working the phone with IMG. Next morning IMG declined to medevac me to the USA. Their rep told JD, correctly it appears, that my policy included medevac to the “nearest qualified medical facility” only (that would be Almater) and “the cost of returning to the home country” (that would be post-treatment). I had declined—foolishly in retrospect—to purchase IMG’s ‘Evacuation Plus Rider,’ providing international medevac for non life-threatening situations. The devil is in the details: My policy medevac coverage pertained to life-threatening situations only. However, IMG agreed to reimburse all costs incurred in Mexico. Decision made. Next day I was wheeled into the theater and succumbed to the anesthetic full of confidence. When I awoke, I couldn’t feel my leg at all thanks to morphine. It was bandaged up to my groin. Dr. Torres promised I’d be home in three days, during which I could not have received better treatment at Hospital Almater. Kindness and professional attention enveloped me. On September 28 I was released on crutches and driven across the border and home via hospital shuttle, closing a chapter on my wayward Baja adventure. I’d learned some salient lessons about proper trip planning, including the absolute necessity of applicable insurance and doubling down on the fine print. Unfortunately, IMG has since been anything but cooperative. I’ve had to deal with an impersonal faceless and seemingly robotic bureaucracy. In a letter dated December 13, 2016, for example, IMG requested a copy of all pages of my passport, plus flight ticket receipts, etc. I replied by letter stating that I traveled by land and that no visa/stamp was issued at Calmexico/Mexicali. I provided photographs showing that I was motorcycling when the accident happened. I did, however, provide details of my passport and U.S. insurance coverage (which, of course, does not provide for treatment outside the USA), as requested. In a statement dated 24 January, 2017, IMG denied my claim because I had not provided: a) copies of all my passport pages; b) flight tickets or travel itinerary; c) other insurance’s explanation of benefits. Once again, on 6th February, I replied, this time with all copies of my passport pages, etc., including further proof of the journey by land (including the above photographs) and reiterating that my U.S. insurance provided no benefits for treatment in Mexico. IMG has not even had the courtesy to reply. Hence, I’ve felt like I have no option but to contact and enlist the help of my friend and consumer travel advocate Christopher Elliott, www.elliott.org. … and now the good news: After eight months, IMG has finally paid up. Case resolved!